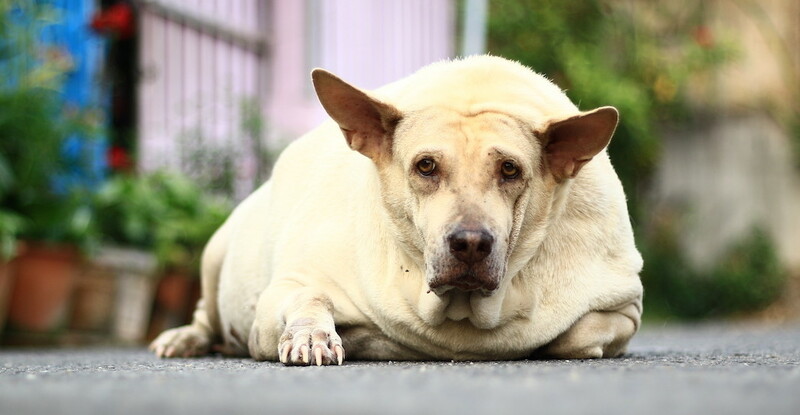 So if you see that your dog is overweight and you’re trying to get your dog to slim down but you’re having trouble, here’s 10 reasons as to why that might be happening. 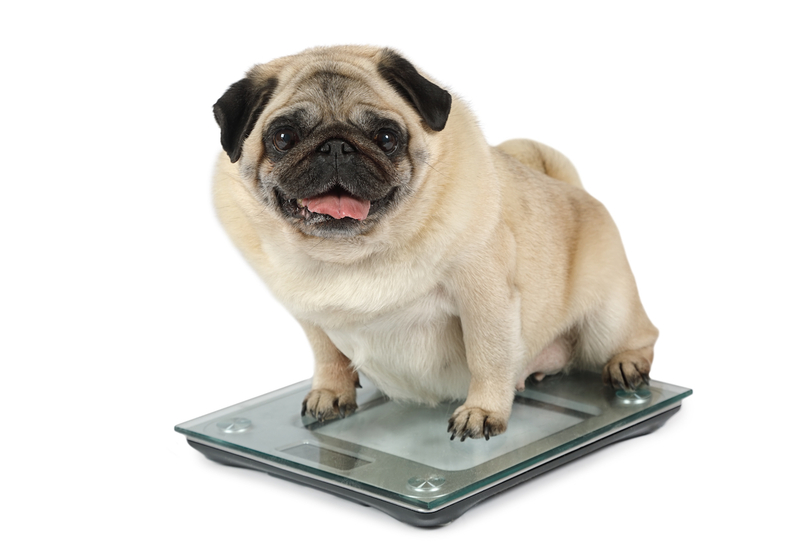 If your dog’s nutrient and caloric calories are met, as it relates to their ideal weight, then this is a behavioral issue. Dogs are master manipulators but with hearts of gold. They’re not going to convince you to invest in their low budget movie so they can achieve their big break in Hollywood, but they will convince you that they need more food when they don’t. There’s a lot of things you can do to help your dog in this situation. For example, you can divide their food into more frequent meals. 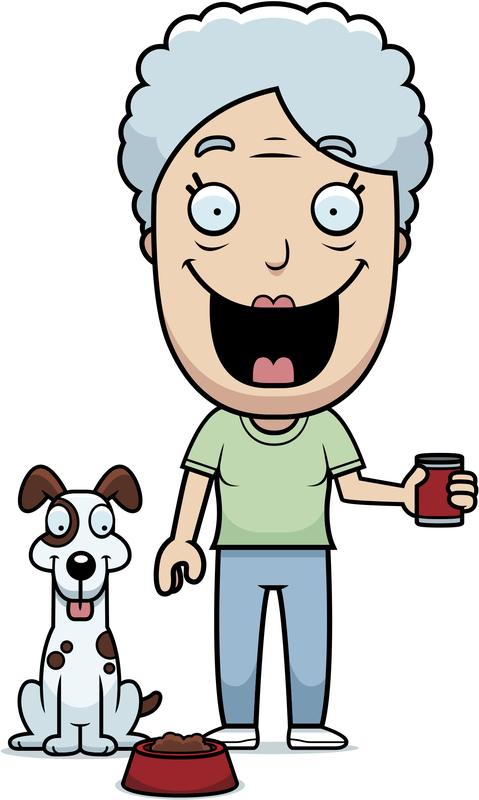 So if your dog gets ½ cup of food 2x per day, split it into a ¼ cup of food 4x per day. You can use their food as rewards for improved behavior. So instead of feeding your dog in a bowl. Every time they come around “Looking Hungry” you can have them perform the desired behaviors you expect from them and then reward with some of the kibble from their daily food rations. Or more physical activities like kibble chase. You could play a game, or activity with them instead of giving them any food at all. For example, you can tug or fetch with them. If you have to give them something different then kibble because you just have too, you can use low calorie treats such as carrots or broccoli, but make them earn it! We had an owner at The Martial ARFS use lettuce as a reward for the behavior we worked on in class. 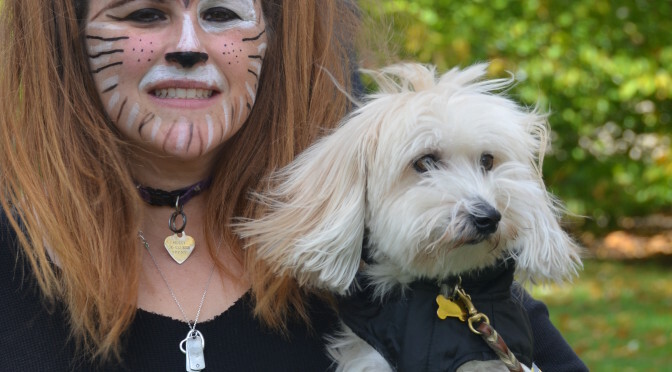 Barking can be even more challenging because the increase in volume affects more people. In addition, you can’t reward the behavior by giving any food, treat or engagement. If your dog vocalizes for food the best thing to do is ignore it, it will eventually stop. When it stops, even if it’s a pause and you know they’re going to start again, give them a low calorie treat or kibble ration during the pause. Then, each time they pause, wait longer to give them the treat or kibble ration. In an ideal world, they will eventually stop barking for food, and simply wait patiently for food, which is very similar to begging, but at least now they’re being quiet. And we already went over how to handle begging. If treating for pauses isn’t working then you have to remove your dog from the situation. Teach them that demanding food by yelling at you to give it to them will only achieve distance, so either another room, garage or even the back yard. Once they’ve stopped they can come back but still no food. Repeat as necessary until the make the association between vocalization and isolation. Because you have decreased the treats and the amount of food, Now Fluffy is getting in to the garbage and stealing food from your plate when you are not looking! (or even when you are looking!!) Keep in mind, this doesn’t mean you’re starving your dog. Again, it’s a behavioral issue. Need vs want are two different things. First, you’ll have to remove her access to these things. So, barricade off the kitchen. Don’t let her around when you’re eating dinner. Yes, it may sound excessive. Like you have to do all this to stop your dog from getting food aren’t they not getting enough food? Wrong! As crazy as it is garbage is delicious to your dog. Same as cake, ice cream, pizza, burger king, or your favorite sea food, steak or Italian restaurant is to you. If you have that around you all the time you wouldn’t be sneaking a piece here and there throughout the day? That’s all your dog is doing. Grabbing bits and pieces of the food they like because they have access to it. It both satiates their appetite and it tastes good. Do you really need to fire off a couple of the chips, gummy bears, milk duds, cookies, or other snacks you might have around? Of course not. You have access to it, it satiates a craving and they taste good. It’s only “stealing” for our dogs because we don’t want them to have it because we’re aware of the harm excess weight causes our dogs. When is the last time you went to the store just for chips? So keep your dog from having access to his favorite snacks and that will solve this particular problem. 4. Not Burning Enough Calories. So you decreased the amount of food you are giving your dog but weightloss is not happening. 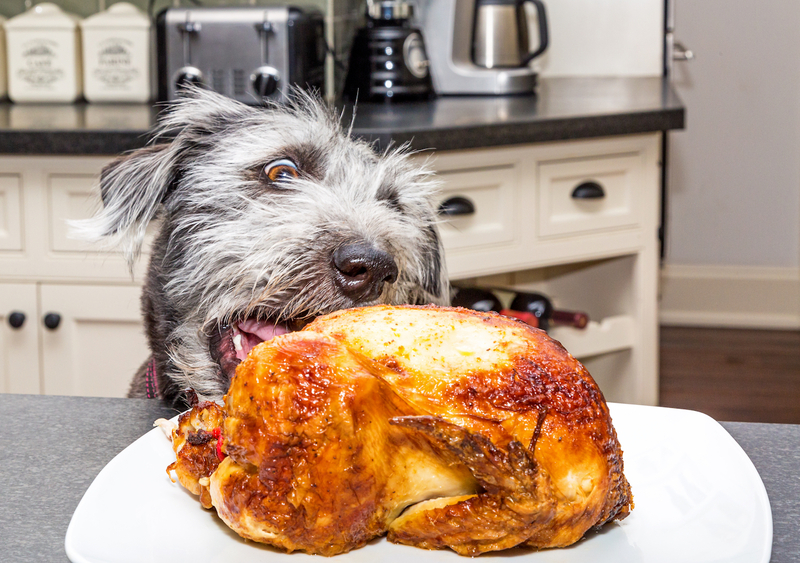 Your dog only needs what its going to burn off in a day. So your calorie modification might have been great for the summer but on those short cold winter days Fluffy might not be getting the exercise she was getting all summer long. So I know it’s cold and dark outside but you’re going to have to step up the physical activity to burn those extra calories. There are endless ways to get more activity even in the house, be creative. As I mentioned earlier there’s kibble chase, tug, maybe even fetch if you have the space. 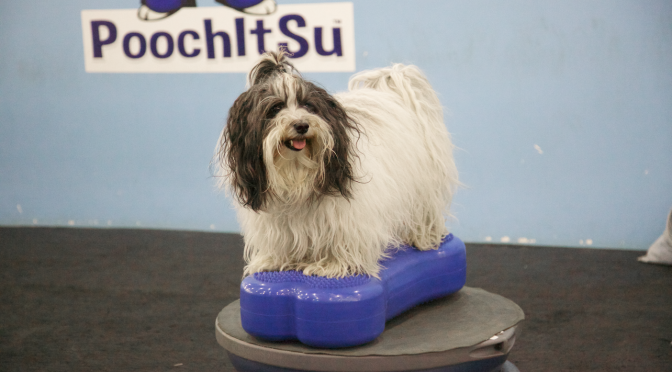 If you have some extra cash there’s canine conditioning equipment to work on core strength and dog treadmills. 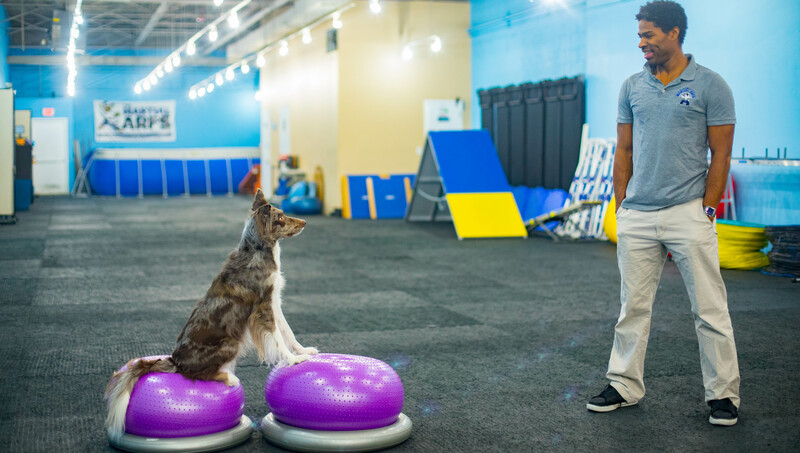 It might be time to consider the activities provided by dog training facilities like at The Martial ARFS if something is available to you in your area. Even if it’s just for the winter, getting together with other dog owners and dog professionals that you know and trust and have the dogs play and exercise together. This is an easy situation to rectify. Feed your dogs separately and not leave food out all day for any pets in the household. As with humans, when one person in the house is dieting it usually effects the way everyone has to eat. Slammin down pizz a in front of your dieting spouse is grounds for divorce. If you have cats, and have to leave food out for them, you can feed them on higher ground so that the dog cannot get to it. Your dog can ruin his whole weightloss program by eating just half of another pet’s food each day. 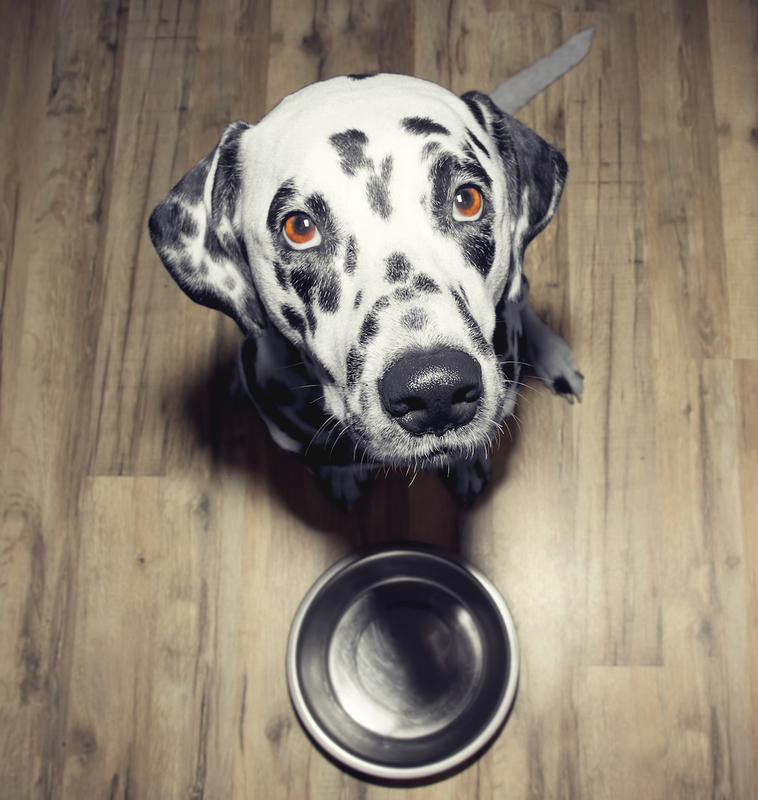 You might not think it’s fair to have to alter all the pets feeding habits but it is important to keep the importance of the weightloss for the health of your dog at the forefront. So like someone in the family trying to lose weight, if everyone makes a change it’s easier for the person having the most difficulty. Diet food is never what we like to eat! So you can understand if your dog doesn’t like it but because they need to lose weight they have to eat it. Simply saying my dog doesn’t like that food and going back to his normal food isn’t fair to your dog. If your dog didn’t like to come when he was called would you still let him off leash just because he likes it better? 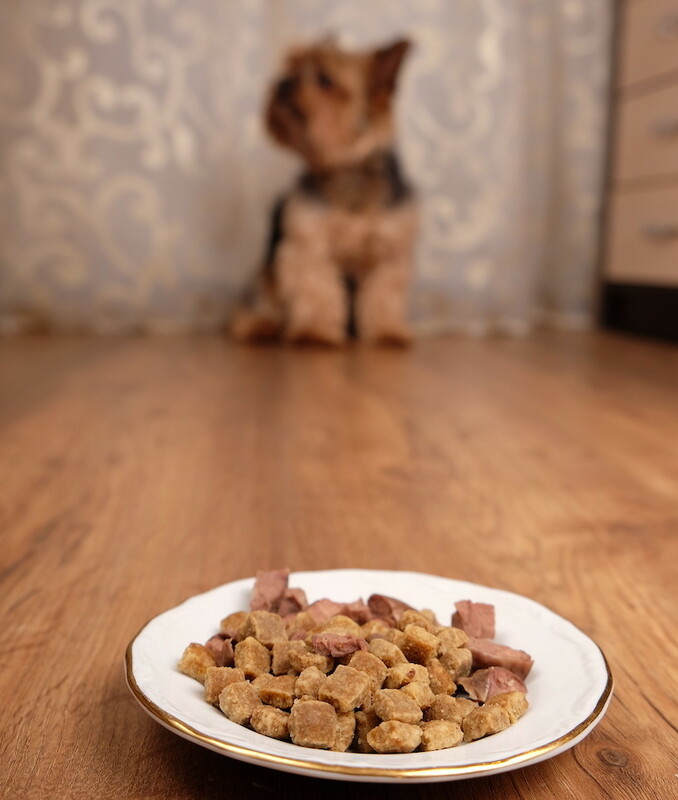 There are a variety of diet foods on the market so you may have to offer a variety until you find one your dog likes. Buy small bags so if they don’t like it you don’t waste too much money. Be sure to introduce the new food gradually over a week mixed in with the old food. Each day put less of the old food and more of the new food until its all new food! Some dog’s won’t notice, others are more crafty. So much that they’ll pick out only the good food and leave the rest for a more gullible dog. 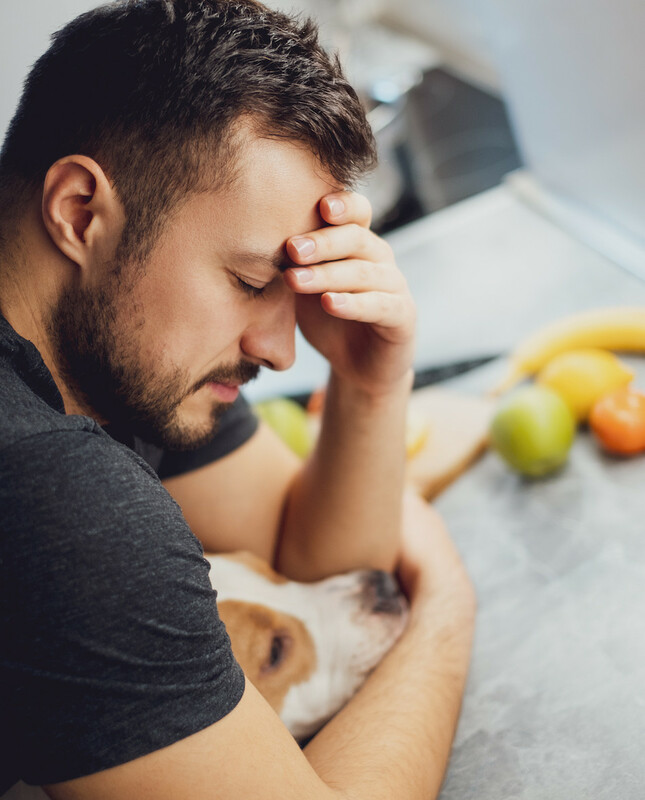 If you’ve done your diligence, or even if you just want to try this first, cut back your dog’s normal food to 80% of their ideal weight recommended feeding before switching to a weight loss food. In many cases this will at least get your dog started on their weightloss way before having to switch to something else if they plateau. This happens in all weightloss programs. The body needs time to adjust. Leptin is a hormone secreted by fat which controls appetite. The more fat, the more leptin that will circulate in the body, the less your dog should want to eat. And the less fat, the less leptin, the more your dog should want to eat. Sounds like a case for carrying extra fat right? Wrong. When the leptin level in the blood is elevated for long periods of time, the body eventually gets used to having it around. 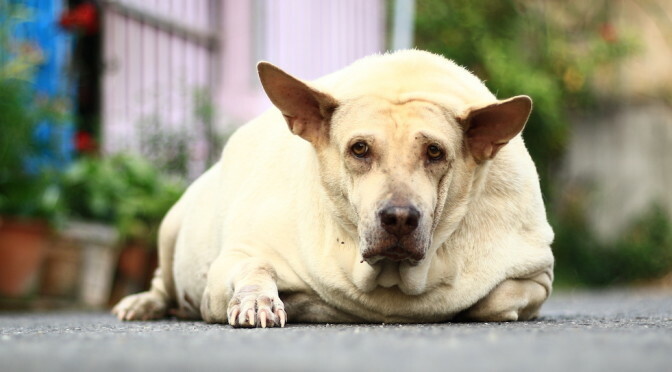 So when your dog loses just a little weight, the elevated leptin level, which is now considered “normal” will drop and it will signal the brain to increase your dog’s appetite. Your dog is signaled to eat more and slow the metabolism down so that your dog will continue to maintain the current body weight. But do not fret! With a little time and a few adjustments to the diet and exercise program, the weightloss will resume. This is a time when patience is needed. Your dog doesn’t like the food. You spend more of the little time you have walking your dog. Your dog seems miserable. You have had enough and just want to give in! This is completely understandable! But do not give in to your frustration. Remember this is important for the health of your dog and she is counting on you to do the right thing. Weightloss is not an easy task. 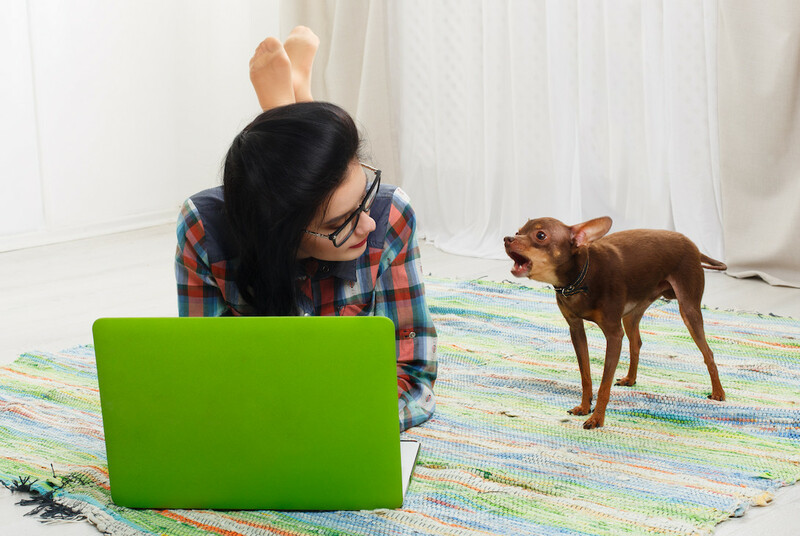 Consider joining an online support group where you can vent your frustrations and get support from other dog owners going through the same problems. And again, this might be time to consider the activities provided by dog training facilities like at The Martial ARFS if something is available to you in your area. 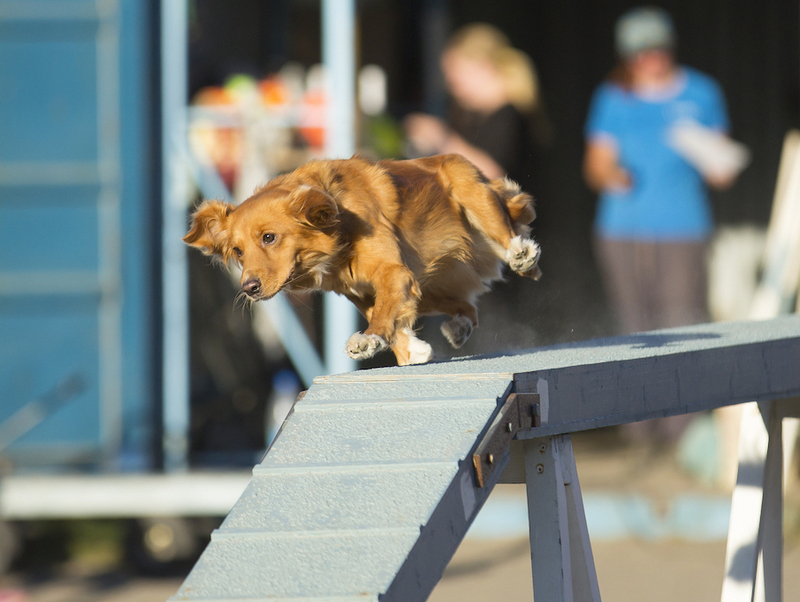 The activities and professionals there can help follow through with your veterinarian recommendations by making it fun and supporting you along the way. A 30lb dog only needs 480 calories per day. That’s one 6oz steak per day. But if your 30lb dog is overweight, let’s say by 7lbs, then they should only eat about 400 calories per day, which is about a 5oz piece of steak. So you might think you’re feeding him the correct amount, you are not. 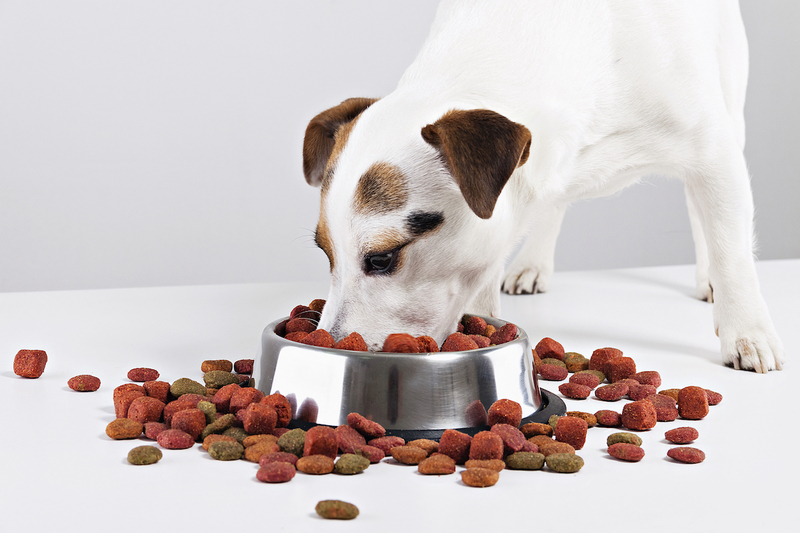 This may still not be enough, you might need to cut your dog’s food to 80% of their ideal weight caloric intake. So if your dog is 30lbs and 7lbs overweight, they’d need about 400 calories per day. 80% of that 320 calories. That’s about one 4oz piece of steak per day. So it’s easy to see how you still might be over feeding your dog. Keep in mind it actually gets harder to grasp how few calories your dog needs the smaller your dog is. If your 20lbs dog is 5lbs overweight and you cut his ideal body weight caloric intake to 80%, it would mean you’d only need to feed him 216 calories per day. That’s about 10 french fries….. per day. That’s how few calories your dog needs to lose weight. And hopefully that makes it a lot easier to understand why they might not be dropping the pounds. There’s one in every house. Grandma, Mom, Dad, the aunt, the uncle, the in-laws. These people, yes, these people. They can and often derail a weightloss program and it can be the hardest one to rectify. It can become personally offensive to your loved one to accuse them of harm to the beloved household pet. But it’s true. Get them involved with veterinary appointments. Let the professionals around you help. They are killing the pet they love so much and it needs to stop. Sometimes it takes an honest sit down, sometimes it’s a lifelong battle, but isn’t your dog worth it? There are still things you can do. With the help of your veterinarian set up a structure. And again, sometimes it helps to bring them not just to the vet, but to a training facility like the Martial ARFS that also promotes health. The more they see the benefit of a healthy weight, or the negative effects of being overweight the more they may get on board. Education is key. Using websites and handouts can help show your housemates how important it is that your dog lose the weight. Many owners or others don’t know what a normal dog should look like so it’s important to help them understand. But there are things you can do. Pre-measuring the food for the day can help family members stick to the diet so if they have the urge to feed the dog, they can use this food and stay on the calorie budget. Feed your dog less and allow for the excess from others. This excess is always best by way of their daily rations, but can include all the other low calorie treats we’ve mentioned here. Many families and individuals within family equate food as love and it seems to make Fluffy so happy. Your dog will love them not matter what, but physical activity and belly rubs will create the same bond of love and they will be healthier to boot without the extra food. For more information on helping your dog maintain a healthy weight sign up for our free online course here. 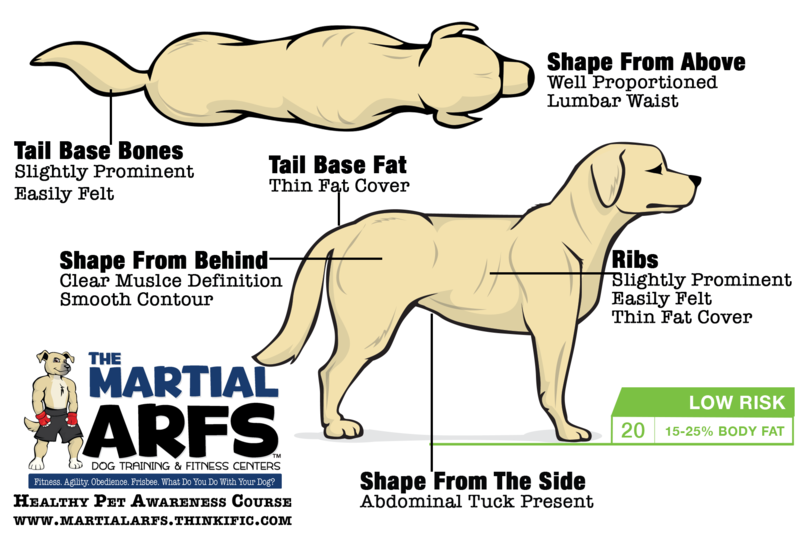 Subscribe To The Martial ARFS Canine Conditioning Blog! 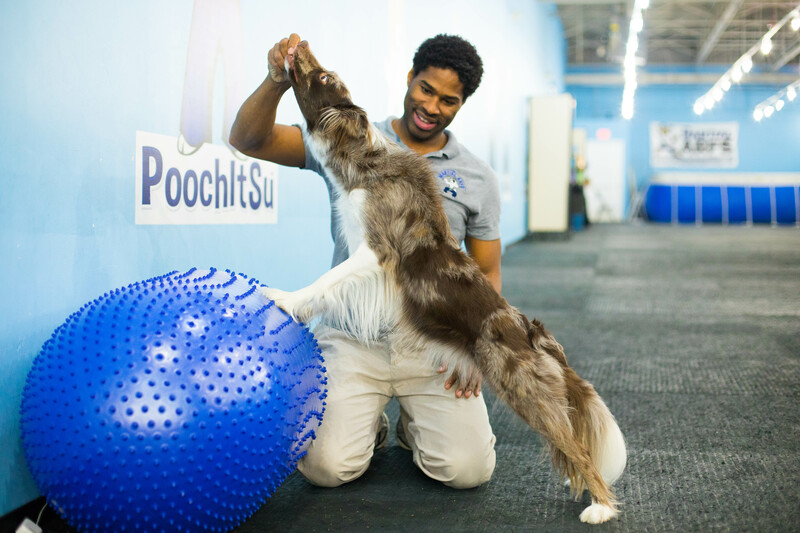 Sign up for free canine conditioning articles, instructional videos, and more!